Alisha Esselstein '15 knew she wanted to go to college in a city – any city for that matter. "I'm from a small town in southwest Wisconsin where the cows outnumber the people," Esselstein quipped, describing her hometown of Argyle. "I always thought that I wanted to go to a big school, so I applied to UW-Madison, UW-Milwaukee, and the U of M."
But, Esselstein said she visited Augsburg College for Scholarship Weekend and "just fell in love" with its small feel within a large urban setting. Today she's a second-year student at Augsburg who has found a balance between her academic pursuits on campus and her desire to grow and learn in the greater Minneapolis community, and she has done so—in large part—through the Bonner Leaders Program. The Augsburg College Bonner Leaders Program is a service-based, work-study program that encourages students to make a lasting change in their community by integrating civic engagement and leadership development into their college experience. Esselstein was one of three Augsburg students who during fall semester 2012 worked at St. Stephen's Human Services, a nonprofit organization that helps thousands of people secure housing and other support each year. Students at Augsburg make a two-to-four-year commitment to participate in the Bonner program and work 10-15 hours per week at one of nearly two dozen local community partners that support issues such as improving educational opportunities, fighting hunger and food injustice, ending homelessness and poverty, and promoting literacy. Bonner leaders select, apply to, and interview for internship positions at community agencies whose services are tied to the students' interests, academic degree programs, or preferred learning outcomes. The hands-on experience at these work study placements can help students discern their vocation and lead to a new direction in their education or career paths. "Bonner has become a really big part of my life," Esselstein said. "At St. Stephen's I realized social work is what I want to do. That one choice, that one split second when I was a freshman and said, 'Sure, I'll go work at St. Stephen's,' helped me choose my major." Esselstein is in the fortunate position that her internship placement offers her meaningful, real-world experience that she can apply in the social work classroom and will need during her job search after graduation. Studies have found that a combination of leadership development, academic expertise, and work experience is precisely what employers expect from recent college graduates. "Bonner students, especially those who come back to the same community partner for more than one year, develop a very real understanding of what it's like to be a professional in a community-based organization," according to Elaine Eschenbacher, Bonner adviser and associate director of the Augsburg Center for Democracy and Citizenship. "All three students who were at St. Stephen's in the fall were also there last year and worked through the summer. They're taking on leadership roles that normally would not be available to an intern, especially since most internships are one semester at the longest." The National Association of Colleges and Employers (NACE) released the 2013 Job Outlook, citing that "employers are looking for leaders." In a national survey, employers named leadership experience as one of the most influential factors in deciding between two equally qualified candidates. Brittney Westgard '14, an Augsburg student from Saginaw, Minn., has found that participating in the Bonner Leaders Program has shaped her career aspirations and preparation. "We're more than interns," she said. "Bonner could be a class in itself because we put an emphasis on engaged learning rather than on service." Westgard interned at St. Stephen's this past fall alongside Esselstein, but began her Bonner experience assisting an elementary school teacher and working with the College's Campus Kitchen program. Westgard took a position at St. Stephen's in order to challenge herself and to expand her professional social work skills by meeting people with whom she had not previously worked. This forward-thinking approach to education will serve Westgard well, considering more than 95 percent of respondents to the national NACE survey reported that work experience plays a factor in their hiring decisions for new college graduates. The survey also found that when "digging deeper into employer's preference for work experience, close to 60 percent of respondents favor experience gained through an internship or co-op." Luke Iverson '15, an Augsburg finance student from Maple Grove, Minn., was the third student to intern at St. Stephen's this past fall. Iverson said he applied to the Bonner program because he needed a work-study job and sought one tied to his interests. He describes his position at St. Stephen's as "more than just doing the dishes. "It's more than just doing maintenance," he continued. "Those tasks are definitely important, too—I think everything has its purpose—but I really like working with people." What Iverson did not immediately consider, though, was that working at St. Stephen's could help him become a better business major. Iverson has benefitted from 40 hours of training and enrichment that Bonner students complete each semester, has learned to facilitate meetings at St. Stephen's, has developed the skills he studied in his management information systems classes at Augsburg, and has mastered his personal time management. Iverson balances his academic and Bonner obligations with additional commitments as a student athlete on the Augsburg Cross Country and Track and Field teams. "I think any good student who's willing to work hard and commit themselves to a number of things knows that time management is key," he said. "If I make a commitment, I'm going to give it my best. I'm going to do everything that's expected of me and hopefully more." It's the initiative Iverson, Esselstein, and Westgard have shown through the Bonner program that could give them an advantage and the professional credentials employers covet. As Esselstein said, "Bonner is more than another course to take or another test to study for; it changes the focus in our lives." 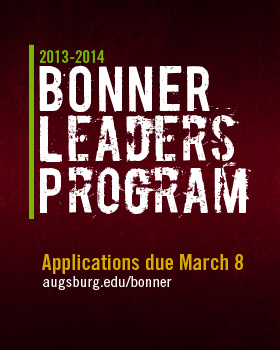 Learn about the Bonner Leader Program application process on the Bonner website. Applications are due March 8.